Can I compete as an elite runner? Very well run . You arrive in the centre of the city around the harbour which have ships from the past to see.When getting to the start it's very easy to drop your bag off.You get called to the start with loads of time. Once you off you have great surport from the locals cheering you on. There one water station around 6k. Two very small slopes but really easy on the legs. When heading back to the finish you head for the main roads past people. Friends and family on both sides of the road upping the noise .Hopefully you be on for fast time with a sprint to get a P.B. As soon as you cross the finish line you handed a bag with your Medal And finishing T-shirt .As you start and finish in the city its very easy to go and Celebrate with food and drink with lots of places to go. Well worth doing very enjoyable. First race I’ve taken part in and I loved it. I chose the Great Bristol 10k as it’s fairly local to me and I’d heard it was a good race. The course was nice and flat, easy to find and incredibly well organised. Plenty of toilets, and even toilets located half way. There was also a water station half way, with Marshall’s handing bottles of water so quick and easy to grab and no need to stop. The support was amazing, from the Marshall’s giving high fives and cheering you on, to the public lining the streets in hundreds. Children had tubs full of sweets, handing them out to give you a little boost. Not to mention the music group and a samba band to give you that little pick up if you feel yourself flagging!! As you pass the finish line it was nice to walk along the short distance for a few minutes, to get your breath back before picking up a great goody bag. Inside was a yummy sweet treat, some vouchers, a top and a nice medal! The bag drop off was so well organised too, buses lined up to find your colour to match your wave. There was friendly people waiting for you to drop your bag in, write your bus number on your hand incase you forget and then check your number and luggage label when you pick up so you know your belongings are pretty safe. Ive certainly got the bar set high for future races now, just hope plenty of others are as good! I really enjoyed this course! I've ran the Bristol Half and its a similar start so I knew what was in store. Great atmosphrere, well organised and fab local support from start to finish! After three Halfs in a relatively short space of time in February/March, it was nice to ease off and settle into a routine of leisurely Sunday morning runs and mid-week gym work. However, without a Half or anything of the like in the diary, I was already starting to get itchy feet, so decided to register for the Gloucester Half scheduled for early August. But between now and then, I only had a handful of local 10K’s to focus on, with Bristol being first on the list.This was to be the fourth time I’ve run this race and with it being in the city where I work, I always feel somewhat obliged to support this great event. 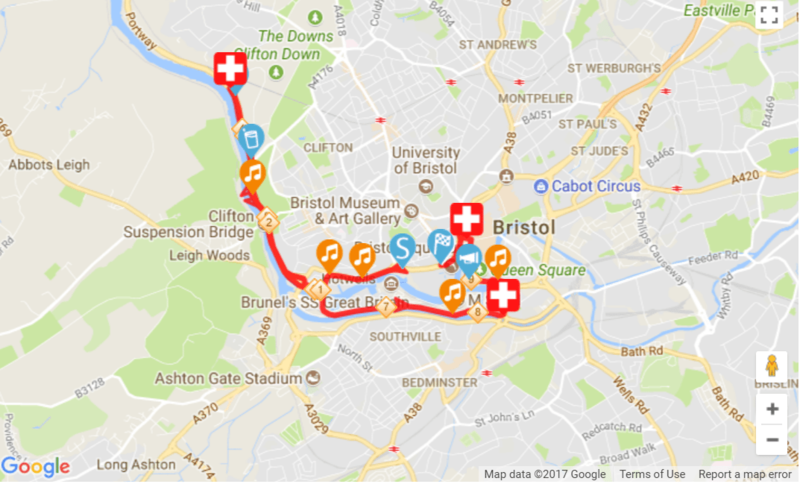 It was previously organised by Run Bristol, but last year it was brought into the Great Run Series. The course is largely identical, save a couple of minor alternations due to road works and route closures.This is by far the fasted and flattest 10K I’ve run (although nearly every urban race website claims to be ‘fast and flat’) and a definite opportunity to run a PB. I don’t run many 10K’s (the last bring this event in 2016), but set my PB of 46.31 on this course in 2014.The event itself is a huge, with an estimated 13,000 entrants in the various categories available. Due to the sheer size, it is staggered into Orange, White , Green and Pink Waves, each starting approximately 8 minutes apart.After a number of long road trips to races in recent months - Watford and Brighton, in particular, it was nice to jump in the car and only have to drive half an hour down the M5, M4 and M32 to reach the city centre, with the added bonus of free parking in my company’s underground carpark!The Race Village is situated in Millennium Square, which is in the centre of the city at the harbourside and surrounded by @Bristol, the Bristol Aquarium and numerous cafes and restaurants, so ideal for spectators and families who have come along to support the runners. The bag drop comprised of half a dozen or so double- decker buses that are colour-coded to represent each wave of runner, so in my case, being in the Orange Wave, I was able to dump my rucksack on the top-deck of an orange coloured bus! There were also all the usual charity, Expo and massage-related stands within the village, which was literally heaving with runners and supporters by 9am, half an hour before the start of the first wave.The big problem and grumble about this event is the lack of toilets…same every year. Catering for over 10,000 runners is hard enough in itself, and whilst the male urinals do help ease the situation to a degree, there are still clearly not enough cubicles. Many of my female friends who ran the race had to leave the queues, still desperate to relieve themselves, and hurry to the starting pens for fear of missing the start of their waves. What really annoyed the people I spoke to was that NON-RUNNERS were queuing for the cubicles, which is totally unacceptable and needs to be addressed for future races (perhaps more vigilant marshalling would help).Right, so onto the race itself. Whilst I’d put in some decent sessions on the treadmill over the past few weeks, I wasn’t really sure of what I was capable of running over 10K as I tend to be more of a ‘Half man’ and train for endurance rather than speed. My aim was to break 46 minutes and I’d have been more than happy with that. However, there were a number of pacemakers (Duracell Bunnies) in each pen and I spied a 45 minute ‘Bunny ‘as I made my way towards the front of my wave. I knew that a 45 would mean running at c. 7.14 min/miles, which I could usually muster for a parkrun, so decided to run on his shoulder, die at around 4 miles and see if I could push though for a 45.59!Conditions were perfect for running a fast time so I felt fairly confident as I waited for the starting gun – flat course, cloudy, 10 degrees and 5 mph wind – this was as good as it gets, so all down to me for a sub 46 and a new PB!One thing about the Bristol 10K is that it gets seriously congested in the early stages. And I mean seriously congested. The first couple of miles are a bun fight, with runners jostling for personal space, fighting to keep their racing line, swearing in frustration as they desperately try not to get tripped up or bumped.After a mile, I’d quickly latched onto the shoulder of Alan, our 45 min Duracell Bunny (who was also wearing bunny ears, which earned him a lot of attention and cheers from the crowds lining the streets!) and was running fairly aggressively to hold my place and focus on the job in hand (by aggressively, I admit that I often use elbows and brute strength to hold my line…survival of the fittest and all that! ).The route took us down Anchor Road towards the waterside, up and over the flyover and along the Portway, heading towards (and under) the iconic Clifton Suspension Bridge.I had estimated that I’d need to run 7.24’s to dip below 46 mins and 7.14’s to go below the magic 45 min barrier. At 2 miles I had run a 7.07 and 7.10 and didn’t feel too bad, so the omens were good! Still a long way to go at that stage though.After heading under the bridge and down the Portway (a welcomed slight decline in gradient), the field had thinned out a little and I’d settled into a nice rhythm, still sitting tightly on the left shoulder of Alan.We turned at roughly 2.5 miles and made our way back up the Portway heading back towards town (now a slight, but not too noticeable incline and little, if no wind). The runners from the latter Waves were all piling down the Portway to our left, and psychologically, it was good to know that we were now technically heading home. Mile 3 was a 7.09, so I was in unknown territory now; I’d run fairly fast 5K’s in the past on a parkrun, but still had over 3 miles to go, so I needed to somehow hold this pace for a while longer. We hit the bottom of Cumberland Road at around 4 miles (a 7.07 posted) which was the point where I had predicted I’d begin to fade and fall back to a pace of around 7.25, due not only to my efforts in the first half of the race, but also because Cumberland Road was a steady incline for around a mile.Alan asked me what me P.B was at around 4.5 miles and his response was that I was around 2 minutes inside of it if I could keep going. He was really encouraging throughout the race and periodically shouted out mile splits and our projected finishing time, which was pleasing to hear, given that I was still hanging onto him!When I ran though mile 5 in 7.08, I thought it was definitely game-on and knew that after the slight hill at St Mary Redcliffe, it was flat through to the finishing line. I made it up and over the said hill (it only seems like a ‘hill’ if you’ve been running at that pace for 5 miles, and as one of my running buddies said afterwards, it may as well have been Everest!) but for the first time in the race, I began to lose touch with Alan. My legs were hurting now and I had a burning sensation in my chest. I figured that even if I fell 10 seconds behind him, it still might be enough to hold on and run a sub 45.The fantastic crowds and support on Prince Street lifted my spirts and I kept Alan in sight, who was about 40 yards ahead of me now. Turning into Baldwin Street I could see the Hippodrome and knew we were about half a mile from home. Time to press my ‘second wind’ button. I specifically train for this situation on the treadmill two or three times a week (it worked at Brighton) and it was time to dig deep once again. As I hit Anchor Road I heard someone shout some words of encouragement to me and I just went for it.I was gradually catching Alan, and was about 20 yards behind him as he crossed the line. To his credit, he turned and continued to encourage everyone who had been with him throughout the race, urging them over the line.My mile 6 had been a 7.21, but I still thought I had enough in the bank to do it. Crossing the line, I was delighted to look down at my Garmin to see that I’d run a 44.54. A PB! A sub 45! Wow, I never thought it was possible! Massively chuffed and beaming inside certainly helped to ease the pain I was feeling throughout my body.The finishers bag contained a decent medal, t-shirt, a bottle of water and some snacks, which were very much appreciated after my superhuman efforts!To summarize, the Bristol 10K is a great event. Well organised, a flat course and amazing support along the course. The toilet situation clearly continues to be an issue, but if that can (somehow) be resolved, then, as a major city running event for mass participants, it would be close to perfect and highly recommended to anyone considering running their first 10K or wanting to nail a PB.Checking the results later that day, I was delighted to see that I’d come 1,155th overall and 132nd in my age category. Still smiling now and pleased to have run so well in my ‘home’ 10K! The Great Run franchise has recently added the Bristol 10k to it's portfolio of races, 2017 was the second time it had been run under the Great Run name, and the usual slick, well organised event that is expected from the group was on hand once again. The entry fee was reasonable and the registration through the Great Run website was straight forward.Using the same start and finish as the Autumn Great Bristol Half marathon, the flat, 10k course took runners out of the city on an out and back route, twice passing under the iconic Clifton Suspension Bridge, before a loop around the harbour and back into the City centre.Getting to the start line was simple enough, road closures meant that you could not park really close to the race hub in Millennium square, I parked in the Trenchard Street multi story car park behind the Colston Hall and walked about 15 mins to the start which was easy to find. I understand that there was a park and ride bus service arranged as well, which from accounts I heard from other runners was a big success.The race hub had a small selection of trade stands, and an information tent, with plenty of marshalls to guide runners to the start. A few more toilets at the start would have eased some long queues prior to the race starting, something perhaps that could be addressed for 2018.I was pacing the event on behalf of Duracell, and decked out in their corporate colours and finished off with a set of fluffy Rabbit ears and tail I took up my place to the easy to find colour coded starting pens which are sorted according to estimated finishing times. The race started bang on time at 09.30am, with waves setting off at eight minute intervals after the first one got away.The run was chip timed and also gave supporters a chance to track runners via a smartphone app.The route was well marshalled on closed roads, with accurate (by my GPS watch at least) makers every 1km, one water station at approx 5kms provided bottled water for runners, and there were a number of bands and musicians around the course to make for a carnival feel. Local support was evident in the city parts of the course, big crowds lining the route around the streets, with a handful out on the portway section of the route.Post race, the usual Great run style goodie bag was on offer, a corded over the shoulder bag with water, tech tee shirt and medal inside, a few leaflets , lindt chocolate bar and a carton of Chocolate milk completed the goodies.Times were quickly available via the website and app, with offical race phots available a day or two after. One point to mention about the post race events concerns the newly revamped medal for the event. Now being a square shape rather than the round type that Great Run has used for a few years, it follows the same format as other years in having a standard design but personalised with the city location and title. Some runners found that their goodie bags contained medals for the Great Manchester run, rather than Bristol, and there appears to be a small flaw in the manufacture of the medals, as all too often in the runner/spectator meet up area a distinct clanking noise could be heard as time and time again medals fell off the ribbons hung around the necks of their owners and crashed to the floor.Despite this a very enjoyable run, with a fantatsic course, great support and good atmosphere which would make this a good run to bear in mind for 2018. I took part in the Great Bristol 10k for the first time today & loved the experience overall. We used the Park & Ride from Brislington which was really quick and straight forward. The only issue we experienced was that there didn't seem to be enough loos for 13,000 runners and the queues were so large that we actually missed the wave we were in originally and had to drop back a wave which was a shame. The course itself was for the most part flat, easy to navigate the marshalls and the local support was fantastic. On the finish you collected your goody bag as you walked through which prevented long queues, the bags were sorted by tshirt size. The finishers tshirt is really good quality as is the medal and the Lindt chocolate was very appreciated! Some will say it is expensive for a 10k however if you take into account the logistics in terms of road closures for the city centre, marshalls etc as well as the quality of the goody bag I think this is good value. Known for its buzzing atmosphere, incredible supporters and the booming anthems that rock the city's streets, experience a running event like no other. And remember, no matter how you get to the start-line and whatever your reason for running...do something to show them what you're made of. For all athletic abilities, the great day of running will feature both the 10k and half marathon distances. The internationally renowned 10k will be staged for the 16th time, with the day also including a half marathon in the heart of the city. The Simplyhealth Junior and Mini Great Manchester Run is a must-do event for budding runners, give your children the chance to experience their own finish line moment as they enjoy the cheers from the crowds and the atmosphere of the Simply Great Manchester Run on Portland Street.